The program is part of the 2018 – 2020 "Toyota – Green Vietnam journey" project signed by TMV and the Ministry of Natural Resources and Environment in 2017. Toyota Motor Vietnam Co., Ltd. (TMV) and the Communication Center for Natural Resources and Environment (Ministry of Natural Resources and Environment) jointly launched the "Toyota joins hand to make schools green" program at Nguyen Hue Junior High School (Cam Giang) on October 7 morning. 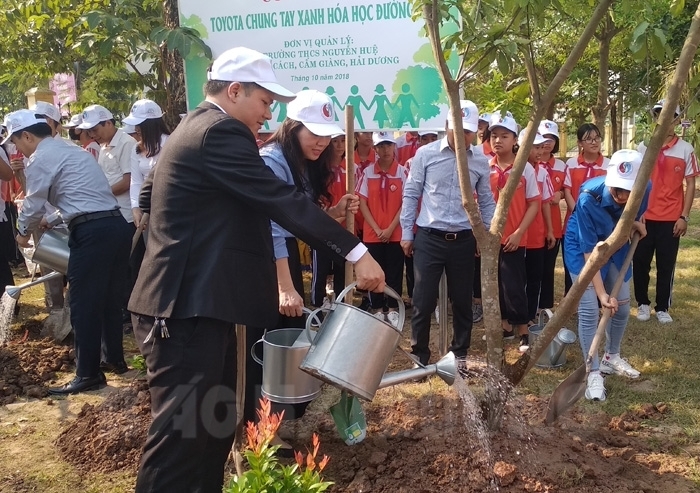 At the event, pupils of Nguyen Hue Junior High School and Cam Vu Primary School (Cam Giang) attended environmental protection courses, planted trees, and cleaned the school's precinct. This year, the program is being implemented at 12 schools across the country. Hai Duong is one of six provinces and cities chosen by TMV to realize the program.